The ball mount is a mechanically engineered structural component, designed specifically for use with Toyota tow hitches in order to accommodate the drop or rise needed to match the tow-hitch receiver to a trailer. The ball mount features a protective paint called electro-deposition coating or e-coat to help protect against corrosion and the environment, along with a powder topcoat to help protect against UV rays and maintain its long-term appearance. 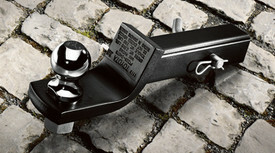 All Toyota ball mounts meet or exceed all industry towing standards..